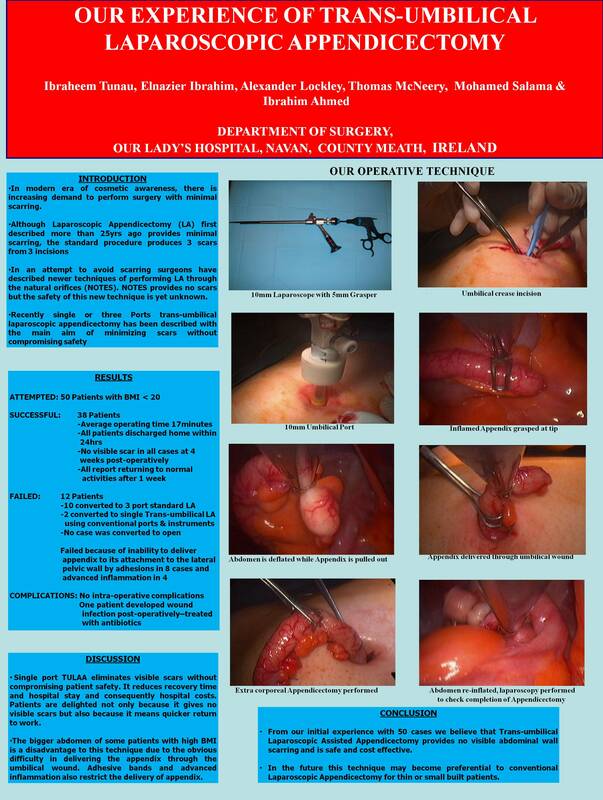 Our Experience of Trans Umbilical Laparoscopic Appendectomy. INTRODUCTION: In the modern era of cosmetic awareness, there is increasing demand to perform surgery with minimal scarring. Laparoscopic appendectomy, although first described more than 25 years ago, has still not been accepted as the Gold Standard in most hospitals. The standard technique involves three small incisions. The end result for the patient means three scars. In an attempt to avoid scarring, surgeons have described newer techniques of performing Laparoscopic appendectomy (L.A) through the natural orifices (NOTES); the safety of this new technique, although scar-less, is as yet unknown. Recently single or three port trans-umbilical laparoscopic appendectomy has been described in an attempt to minimize scars whilst optimizing safety. PROCEDURE:As demonstrated in our short video clip we use an operating 10 mm telescope which contains an optical and operating channel. The port is passed directly through the umbilical crease by open laparoscopy. After achieving pneumoperitoneum a grasper is passed through the operating channel and diagnostic laparoscopy is performed. The tip of the appendix is grasped and pulled out with the port through the umbilical wound, and the procedure is completed as open appendectomy. The average operating time was 17 minutes. RESULTS: We attempted the procedure in 50 patients with BMI < 20 and were successful in 38 cases. All successful cases were discharged home within 24 hours. One patient developed wound infection which was treated with regular dressings and antibiotics. None of the patients had any visible scar when reviewed at 4 weeks, and all patients returned to work within 7 days. Attempts to deliver the appendix through the umbilicus were unsuccessful in 8 cases, due to attachment to the lateral pelvic wall by peritoneal bands. Advanced inflammation in 4 cases made the appendix adherent to the lateral pelvic wall. All 12 unsuccessful cases were converted to standard L.A. DISCUSSION: Longer operating time and obvious scarring remain the principal disadvantages of standard L.A. Single port Trans Umbilical Appendectomy both reduces the duration of appendectomy and, importantly, eliminates visible scars whilst providing all the benefits of diagnostic laparoscopy. The use of a single incision causes less pain reducing recovery time and consequently hospital stay. Shorter hospital stay reduces the cost to the hospital, but also to the patient, as it means quicker return to work. Most importantly, the patient will have no visible scars. Major disadvantages include the limiting BMI and failure when band or severe inflammation restricts delivery of the appendix through the umbilical wound. Future option may be: three port trans-umbilical appendectomy using conventional instruments, or the recently developed 15 mm umbilical port, with 3 channels, using flexible instruments. CONCLUSION: From our initial experience with a small number of cases we believe trans-umbilical laparoscopic assisted appendectomy is safe and cost effective with excellent cosmetic results. In the future this may become preferential to conventional Laparoscopic Appendectomy for thin patients.